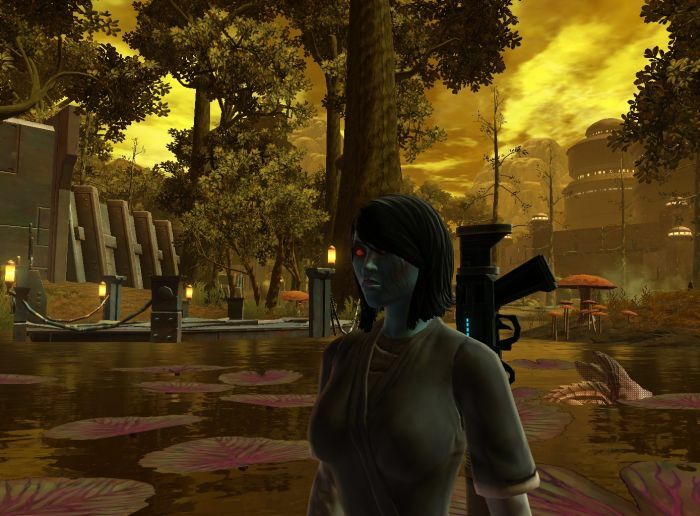 So About That Game I Wasn’t Going To Play… #SWTOR – Nomadic Gamers, eh! I didn’t mean to. My finger slipped! Some how I found myself typing in the user name and password to my other half’s account, and before I knew what had happened, I had created a Chiss Imperial Agent. Before today I didn’t even know what a Chiss was. In fact before today there were many things I didn’t know. Like the fact that Anakin is Darth Vader. Or that the Empire is the bad guys (technically) and the Republic is the good guys. I’ve only seen one Star Wars movie, and apparently it was “the wrong one” to watch (I think it was episode one, and the one that’s labeled episode one, not the REAL episode one). I’m working on fixing that as we speak. All of my posts involving SWTOR (and I don’t know how many there will be, I don’t have my own account and I’m leery of purchasing a copy of the game for myself) will no doubt have many errors and come from the perspective of someone who is still learning so please have a little patience. I created a Chiss. Character creation followed the path of every other MMO out there, and I found the options a bit limiting. It felt odd to go back to a race / class restriction after going without in many games, but I assume that this is due to the ‘laws’ of Star Wars. After browsing through the class options (which I knew absolutely nothing about) I decided to just go with an Imperial Agent, which is a sniper type class (so far at least). I get to use rifles, and I throw bombs and for the first 7 levels at least I’ve taken great delight in hiding behind every little object on the ground while I pick off mobs one at a time. The story so far is fantastic. I love having options in my responses and I love that they influence my character. I also love the voice acting. I may not know anything at all about Star Wars, but I do know about MMOs, and I know what I like and don’t like. So far, I like this.